We were visiting our family in Canada and we went to Niagara Falls which is very beautiful. 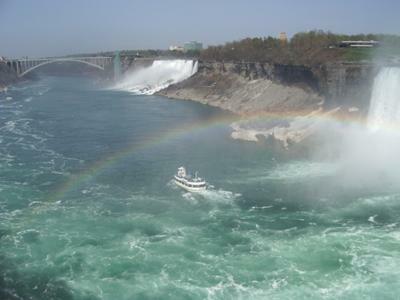 I hope you like this picture of the American Falls and the Maid of the Mist. Thank you Marjan, for your submission to our photo contest - mooie foto! I can see why the bridge at Niagara Falls is called the Rainbow Bridge! This picture captures it perfectly - I saw a rainbow when I was at the Falls but I didn't have my camera - this is beautiful.